Tropical trails may impose some fascinating challenges for new comers. If you happen to be one of an adventurous group of people who come to Costa Rica looking for wildlife. The first challenge is figuring out how to navigate dirt trails, ridden with roots of all sizes, while looking up into the forest canopy. Believe it or not, there is a valid reason for this somewhat dangerous, yet technical, maneuver, and it is associated with light... photosynthesis.... and some other very important features that compound the lushness in front of you. Light travels down from the sun and the first surface where reaches, is the top of the trees. It is no coincidence then that most of the activity will take place here, as food is readily available after intense light reaches those giants in the rainforest. Many layers will be in front of you as you try to set your binoculars in the most awkward position for your neck. But the effort may prove to be very worthwhile. Amongst the myriad of plants and yes, lianas or roots or branches, and depending upon the type of forest tons of epiphytes, is there that you will find all the rainforest fun. It is a jungle out there after all, and if you pay close attention you may encounter all those little and large details that make up some of the most complex ecosystems known to mankind. Wildlife observation is always fun but after looking at and smelling a number of flowers it´s time for a little action. Many animals thrive in this ecosystem; perhaps the most visible are birds and mammals. Most seasoned guides will be looking for two things, sounds they can identify before anyone else or sudden movements, both lead and then binoculars for close up and further identification. Monkeys are ubiquitous in our forest and even though primates are essentially tropical in nature, our monkeys of the Neo-tropics have their share of uniquene charactaristics. The Neo-tropics are those forests found from Southern Mexico to a very large part of South America. Neo-tropical monkeys are all arboreal and, yes, they live mostly in the canopy. In Costa Rica, we have four species of monkeys and their habits and distribution reflect, in many cases, their feeding patterns. Three of these species are somewhat robust and have strong prehensile tails, the fourth species is small and mostly found to the South on the Pacific slopes all the way into the large rainforests of South America. 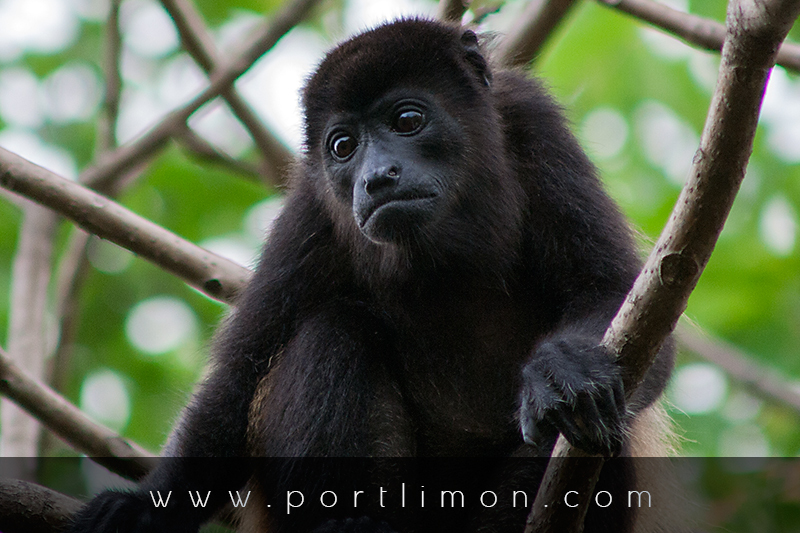 Starting with the species that may prove to be the most common but not the largest in size is our Mantled Howler Monkey (Alouatta palliata). It is fascinating to think what those first Europeans thought when they arrived in Costa Rica and heard these monkeys for the first time. And yes, there is a reason for this comment, male howler monkey use a loud potent sound produced in special chambers in their throat, to mark territory early in the morning, and to play pretend otherwise during the day as protection against larger animals and potential predators. This call can be heard from a couple of miles away. Their feeding patterns though, reflect their character, as they are strictly vegetarian and constitute the only Neo-tropical species that eats large quantities of leaves. "Howlers are heard more often than seen," is a phrase you will commonly encounter around naturalists. They move slowly, usually along tree branches, although they can come down to the ground when strictly needed. Usually they are easily spotted not only because of their powerful call, but because they spend a good deal of their time resting. And yet again there is a good reason for this, they may eat flowers, buds and fruits, but they need to digest very though material found in leaves. They live in groups we call troops, which can be around 20 perhaps less, and sometimes even solitary male youngsters. They exhibit a fascinating hierarchy both for males and females. A curious feature is that since their feeding habits do not require that they move fast, they walk or run on all fours, their tail curled. As arboreal as they may be and having indeed a prehensile tail do not mean that they leap or swing through the forest, and they look somewhat clumsy. 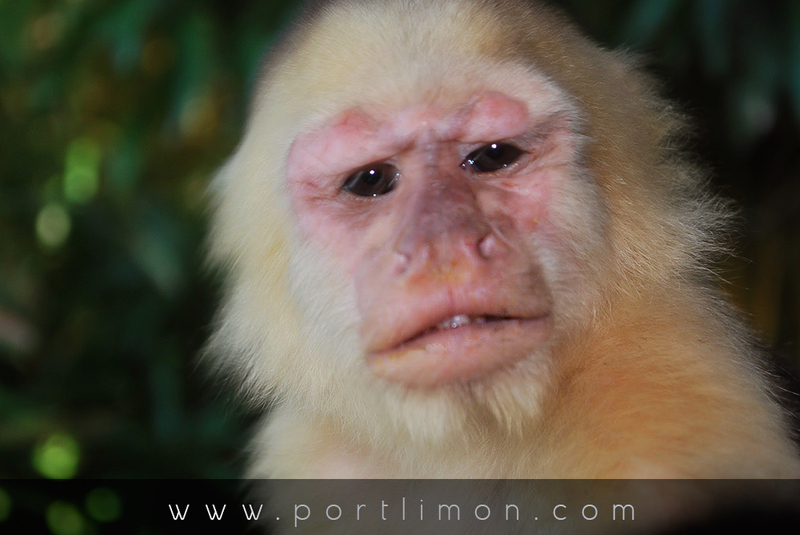 Arguably the second most common species is the White Face Capuchin Monkey (Cebus capucinus). A vivid reflection of what hunting and gathering means as a feeding strategy, they can be easily identified for their totally black body and pale yellowish face as in a hood. They are hunted extensively for the pet industry, and by farmers who try to prevent them from stealing their crops. Their feeding habits make them aggressive as they scavenge and hunt, and basically eat anything along the way. These monkeys are known to use twigs and other tools to open crevices or any other structure where they think there might be food. Their diet includes ripe fruit, buds and flowers, small animals and bird eggs. 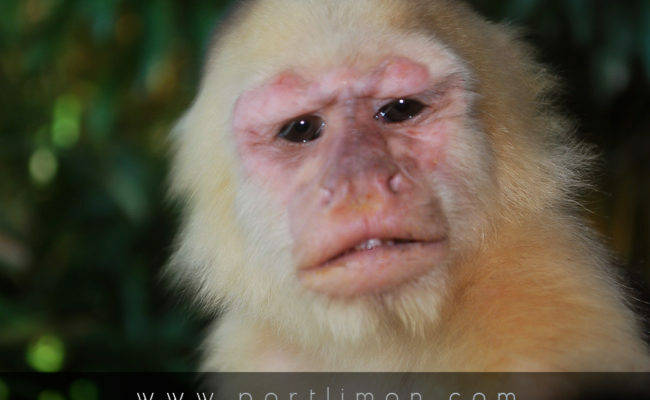 There are claims that these monkeys will destroy native beehives for their honey, a feat not so incredible if you know that those bees are stingless. Their calls are easily discernible by trained ears, and in general they are of a higher pitch than calls of Howlers. There are many face expressions that will bring to mind a close relative of yours as they use those for intimidation and general communication. Whatever you do, do not disturb them and please by all means do not feed them, other than that the worst danger you may find yourself in, is if when looking up you forget to close your mouth, certainly do not do that. Capuchins are definitely arboreal but go up and down the trees and it is not uncommon to find them near or on the ground. They move in groups that range from 5 to 30 individuals and they will disperse broadly when looking for food. Males can be aggressive with each other and a common threat is to show their teeth that expose considerably large canines. 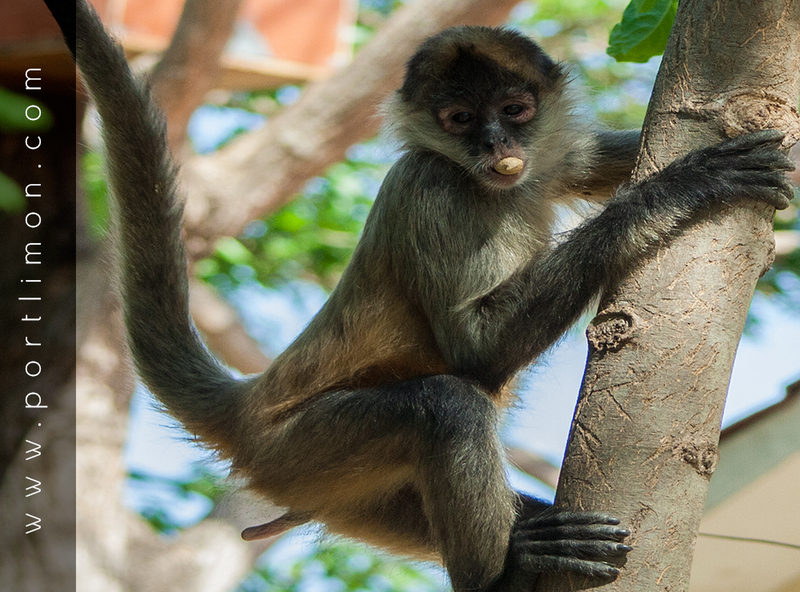 And just as our dear howlers, you could also find these monkeys straddled over a large branch at midday. Records show that in a confrontation between Capuchins and Howlers the latter will make a run for it, figuratively speaking of course. 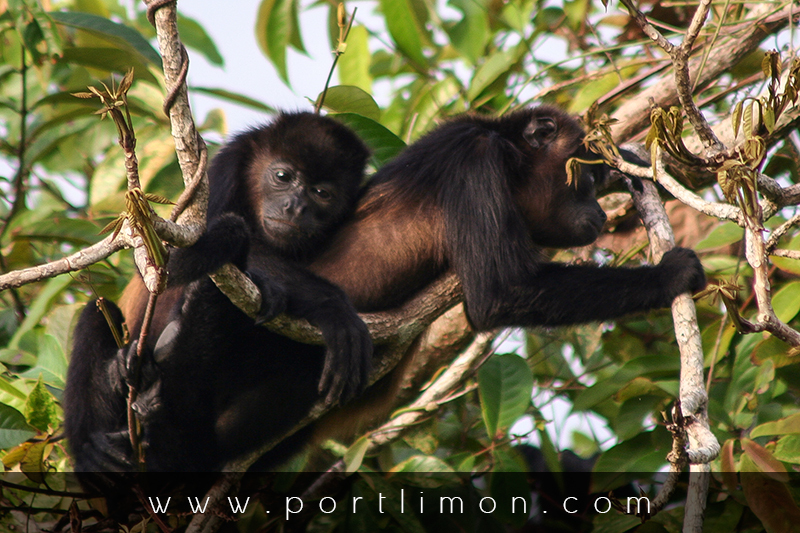 Third but certainly not least is the Spider Monkey (Ateles geoffroyi). The largest and probably the most mobile of our monkeys, it is easily identifiable by their pear like body, its very long limbs, very small and out of proportion head, reddish brown fur and shear volume. 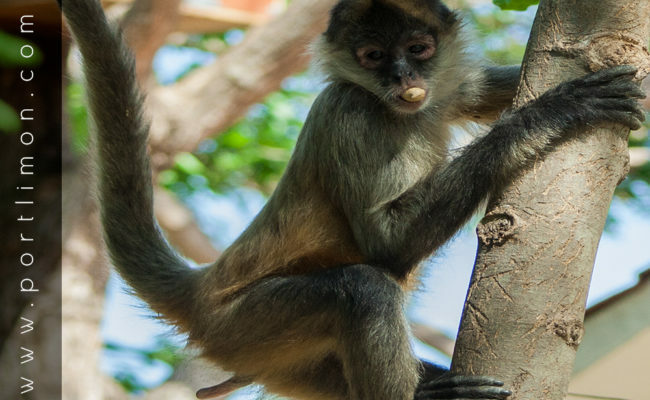 Spider monkeys are the rainforest jugglers as they literally play and swing from branch to branch taking long leaps into the air when they need to. All spider monkey have 4 fingers in their hands, which function as a hook and allow them to perform their stunts. Depending on what part of the country you are in, their fur may show differences in coloration. Spider monkeys are very agile and fast, and alternate running on all four with swinging from branch to branch in a hand over hand motion. Unlike other monkeys, the Spiders hold their tails up above the level of their back, and they use it to grab branches and sometimes even food. It is a marvelous show to watch any monkey as they are so humanlike, but Spiders are certainly the most graceful and swift in their movements. 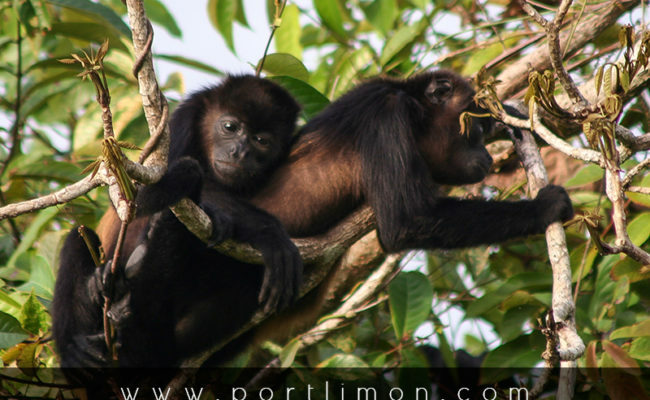 Their diets consist mostly of ripe fruit, but unlike their cousins the howlers who are slow, spider monkeys need to travel long distances in the rainforest as ripe fruit is not readily available and they need to cover extensive terrain. Troops can be as large as forty, always very high up in the tree tops, but interestingly when looking for food, they split into smaller groups of 3 to 8. They are also known to eat flowers, decaying bark and young leaves. 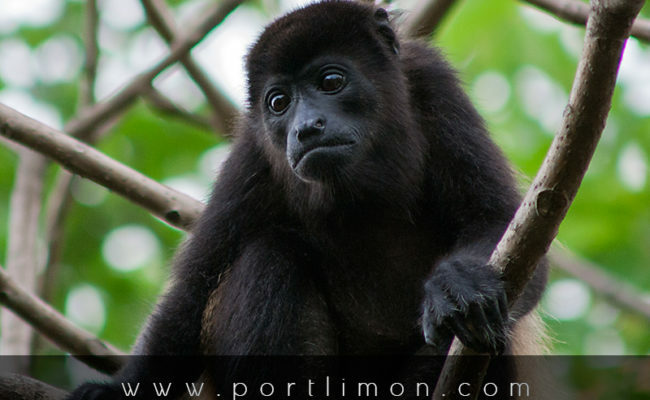 They can be very aggressive, bullies even, especially in the presence of the shier howler monkey. They shake trees or branches and break pieces, while they growl, and drop their feces and urinate. I must say again, do not disturb them but above all do not stand under them. And last but not least is the fourth and most restricted in range in Costa Rica. Mainly a South American species, the Red-Backed Squirrel Monkey (Saimirii oerstedii) is commonly found in more open areas on the southern Pacific Coast of Costa Rica. Indisputably the smallest monkey in Costa Rica, it also shows a very attractive fur, with orange brown back and legs, and a black and white face in a beautiful pattern. 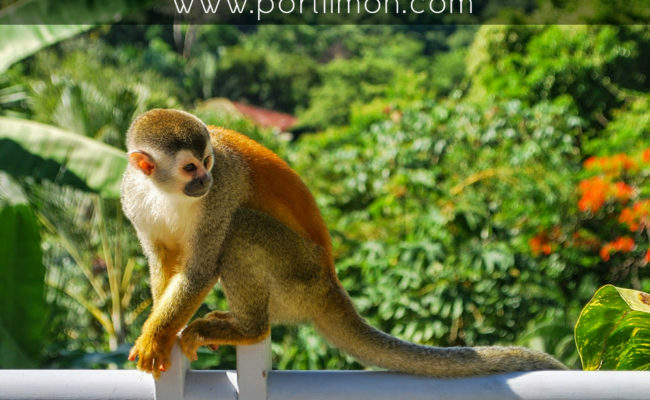 Squirrel monkeys do not have a prehensile tail. 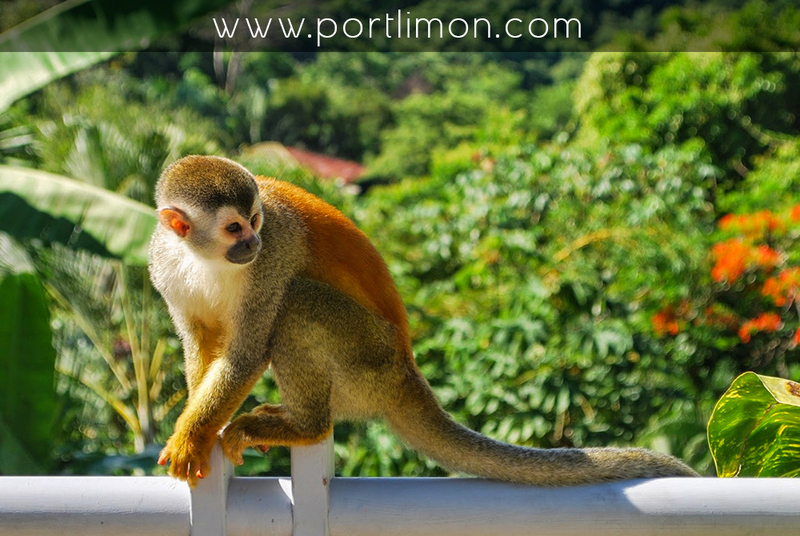 Very playful and certainly not, by any standards, shy, the Squirrel Monkeys can live among human dwellings without difficulty. 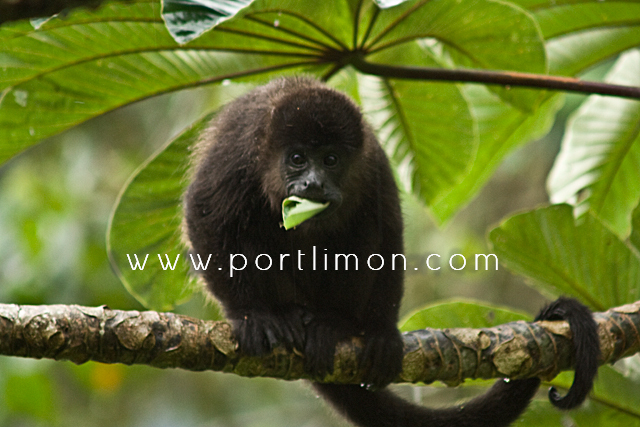 It is very easy to spot them in Manuel Antonio National Park and certainly in Corcovado. 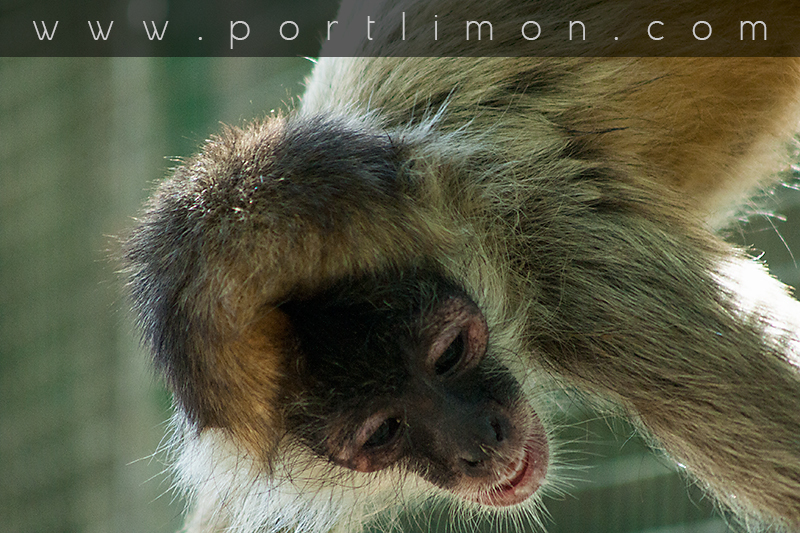 These monkeys are very detailed oriented and you can observe how thorough they are looking around. They move in very large sized groups, as much as 35, and certainly create havoc wherever they go, making them easy to find. The way they look for food is by investigating every little detail in front of them, leaves, a nook, crannies going after small animals. Their diet is varied, even though it consists mostly or invertebrates, but also fruits and flower nectar are important. Although the company of birds is a feature shared by other groups of monkeys in their pursuits through the forests, Squirrel Monkeys in their flurry of activity attract mixed species of foraging flocks including kites and woodpeckers, which hunt flying insects in their desperate run from the monkeys. Squirrel monkeys are about as arboreal as you can get. 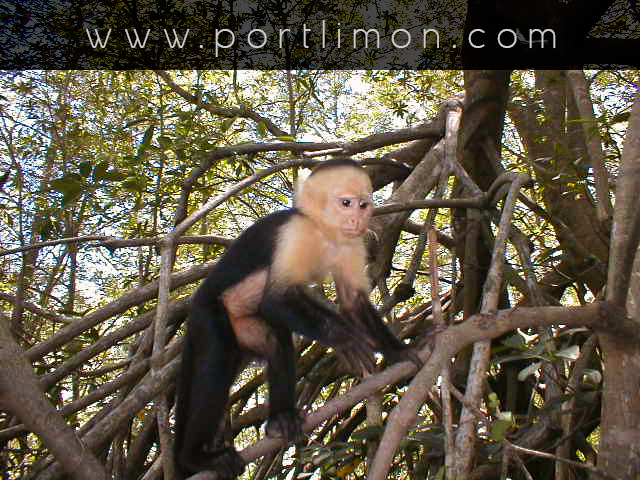 They utilize all levels of the forest and are not uncommon in second growth or open spaces. Like so many other monkeys and wildlife in general they are hunted extensively for the pet trade, and are loosing their habitat to humans, their settlements and agriculture. So, when in Costa Rica, look up into the trees looking for wildlife, enjoy the beauty and splendor of our bio diversity, but above all remember not to disturb the wildlife and when it comes to monkeys do not stand under them, and if you do, be aware to keep your mouth shut.